Today is December 26th. I have jokingly said all Christmas that today is my favorite day of the year. Shopping is over. Presents have been wrapped and unwrapped, cooking is completed, and dishes are washed and put away. Time for much-deserved rest. I am so blessed to have had my family and friends here at my home again this Christmas. We had so much fun and it was well worth the effort. So come on in, and take a peek! Some of our dearest friends came over for a little party on the 21st. I again used my silver reindeer as a centerpiece with fresh greenery, and silver accents. Most of my silver pieces came from estate sales. My candlelabra were won at an auction. I love using them at Christmas time. I have been polishing silver since early December. I had originally planned to use glass plates, but with the number of people attending and the proximity to Christmas, I changed my mind, put them all away, and went with faux glass (plastic)! I decorated my epergne with silver and gold fruit and accents. A small tree decorated with mercury glass ornaments sits in a fishbowl in the corner of the dining room. The menu consisted of shrimp, bacon-wrapped scallops, beef with horseradish and rolls, crab dip, mini crab cakes, buffalo chicken bites, mini beef wellingtons, caprese skewers, veggies and dip, fruit, various cheese appetizers, and a beef/sausage appetizer dip on party bread. I opened up the server for desserts. The kitchen island served as the beverage center. This is a cranberry-pomegranate martini punch. We also served homemade eggnog, whiskey sours, beer and wine. The kitchen table also served snacks and cookies. It's always fun to catch up with my daughter's friends and their parents! My next function was Christmas Eve dinner with family. Luckily, I was able to use the same centerpiece, with just a few tweaks. My Christmas china is Holly Holiday. A touch of red with goblets, napkins and flowers added a festive touch. Yall come back soon, I will be posting more of Christmas!! Hope you all had a happy holiday! Thanks for visiting with me!! Thanks to Susan at betweennapsontheporch.net for hosting! 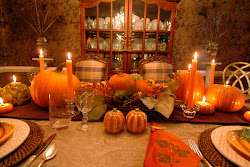 Your home, food presentation and decorations are absolutely beautiful! I hope you and yours had a Blessed Christmas and will have a safe and Happy New Year!! Stunning my friend..you outdid yourself! This is a fabulous Christmas set up with lots of great food and amazing decor and happiness with all the family and friends.! Wow, Betsy...you really "put on the dog" as my great-Grandmother used to say!!! The buffet you set for your party was pretty spectacular!!! Every piece of silver was gleaming, every bite of food looked wonderful, and the decor was just beautiful! What a spread and what a way to spread it!!!! :-) I don't blame you one bit for going with the "faux glass" with events that close together!!! A woman's got to make choices in this life, and sometimes that means "faux glass"!!! 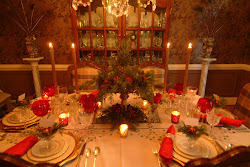 :-) Your Christmas Eve celebration table was beautiful, too, with the gorgeous china. So smart to create a centerpiece that could easily transition from buffet to a sit-down dinner situation! Decorating (especially during the holidays) is about working SMART, not hard! I am just in awe that there is sufficient space for a full-sized tree in your dining room!!!! OH, how I wish! So glad you enjoyed your Christmas celebrations, and I wish you a very safe and happy New Year!!!!!! Looks like you've been having some fun! Everything looks so festive! Your menu sounds great and your tables look so pretty! 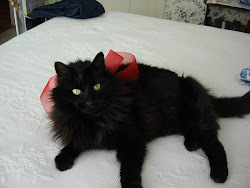 Merry Christmas, Liz! All your tables are beautiful! I have to know, did you make all that food for your cocktail party? Talk about an amazing menu, and I bet your guests were wowed with the cranberry pomegranate martini punch!Gorgeous! Betsy~ I'm drooling over you menu AND your beautiful appointed dining room complete with gleaming silver! 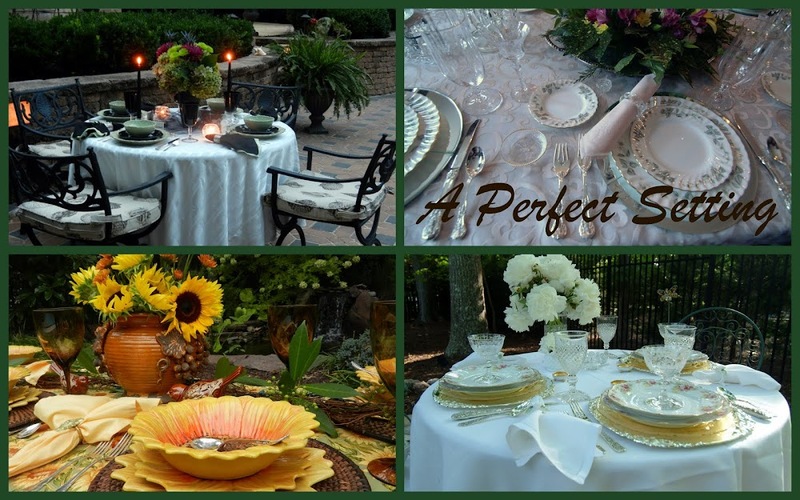 As always, you have the Perfect Setting! Your martini punch looks beautiful and sounds wonderful! Wishing you a Merry Christmas week & Happy New Year! Just stunning, I would have felt like royalty being at your parties! Happy New Year to you and the ones you love! It looks beautiful, Betsy, so elegant! Wow...i find here something unique, such a great thing that you are sharing. keep sharing.